The Tennessee Walking Horse breed began when Confederate Pacers were crossed with Union Trotters. The blood of the Thoroughbred, Standardbred, Morgan and the American Saddlebred also contributed to the development of the "world's greatest pleasure, trail and show horse." This horse was initially used mainly for utility and riding stock ,but quickly gained popularity for its ease of gait and ability to stride faultlessly over the hills and valleys of middle Tennessee. The Tennessee Walking Horse has gained popularity throughout the world for its gentle disposition and versatiliy. The docile temperament and smootheasy gaits cause him to be in demand as an English or Western pleasure mount. There are many breeds of horses, but only one Tennessee Walking Horse! This member of the light breeds of the equine family is no mystery horse, nor is there anything of magic or difficulty in understanding about his makeup. In the beginning came the Narragansett and Canadian Pacer. The War Between the States occasioned the cross-breeding of the Confederate Pacers and Union Trotters; thus the Southern Plantation Walking Horse or Tennessee Pacer came into being. Next came the blood of the Thoroughbred, Standardbred, Morgan and the American Saddlebred. All were fused into one animal in the middle Tennessee bluegrass region. The result, over countless years, was the "world's greatest pleasure, trail, and show horse," -the first breed of horse that bear a state name- the Tennessee Walking Horse. For those who think the Walking Horse is comparatively new on the equine scene, pages of history reflect the strong influence this animal has had in the building of this great land and in the daily lives of our forefathers. Mainly used for utility and riding stock, he gained wide popularity for this ease of gait and ability to stride faultlessly over hills and through the valleys of the rocky middle Tennessee terrain. Being used as a utility animal for all type of farm work, as well as family transportation and recreation, the old Plantation type horse was not trained for showing in those days. This natural gait was most often inherited from his breeding. In 1885, a cross between a stallion called Allendorf from the Hambletonian family of trotters, and Maggie Marshall, a Morgan mare, resulted a black colt with a white blaze, off hind coronet and near hind sock, Black Allan, foal of 1886. 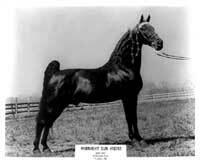 He was later to be chosen by the Tennessee Walking Horse Breeder's Association as the foundation sire of the Tennessee Walking Horse breed and designated as Allan F-1. A cross between Allan and the Tennessee Pacer helped produced today's Tennessee Walking Horse. The Tennessee Walking Horse has impressed the world with its gentle disposition and its kinddly manner and continues to prove itself as one of the most versatile horses in the land. This docile temperament, together with its smooth and easy gaits, has caused it to be much in demand across the United States and abroad. It serves nobly as an English or Western pleasure mount and has taken the young, the aged, the timid, as well as experienced riders along pleasant path and trails. The flat foot walk, running walk and canter are natural, inherited gaits and can easily be recognized from the time a young foal starts to amble beside its mother, with rhytmic coordination of legs, head and body movement. 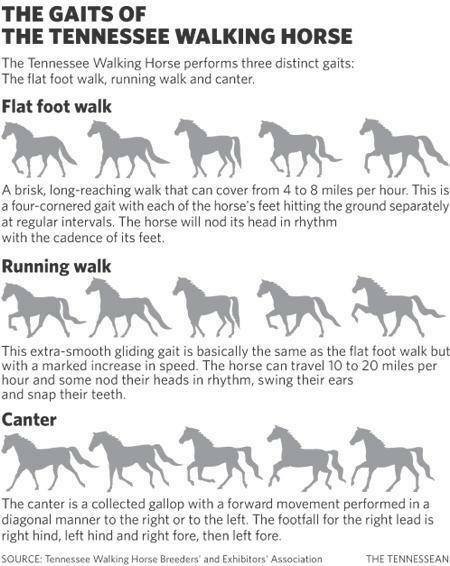 The flat walk and the famed unique running walk are both basic, loose, four-cornered gaits, a 1-2-3-4 beat with each of the horses' hooves hitting the ground separately at regular intervals -first the left front, then the right rear, the right front, followed by the left rear. As he moves, his head will nod in rhythm with the regular rise and fall of his hooves, overstriding with his hind foot the track left by his front foot -left rear over left front, right rear over right front. In general, he should travel in a straight, direct motion, never winging, crossing or swinging. The flat walk should be loose, bold and square with plenty of shoulder motion. The running walk should also be executed with loose ease of movement, pulling with the fore feet, pushing and driving with the hind. There should be noticeable difference in the rate of speed between the flat walk and the running walk. But a good running walk should never allow proper form to be sacrificed for excessive speed. The rocking chair canter is a high rolling collected gallot with distinct head motion, chin tucked and in smooth collected movement. The world's greatest pleasure, trail and show horse The Tennessee Walking Horse is not enly exciting in the show ring but also out of the ring. It is the perfect mount for pleasure and trail riding, as well as a working horse. Because of the easy gaits and even temperament, a rider can comfortably stay in the saddle many hours longer. With the increased interest in trail and endurance rides across the country, the riding value of the Tennessee Walker steadily climbs. Both horse and rider come through less fatigued because of the durability, strength, and smoothness of the walking horse gaits. Highly used in the Ride-A-Thons of yesteryear, one can't argue with success, and consequently, the Tennessee Walking Horse's talent as both a pleasure and trail horse is being more and more widely recognized. It isn't unusual to find him on the trails and hillsides of the country.